The Balkans is a gorgeous area in South-Eastern Europe. Think - wine regions, ancient ruins, beautiful forests, cobble-stoned streets and historical castles. The Balkan Peninsula is bordered by the Adriatic Sea on the northwest, the Ionian Sea on the southwest. With each country more exciting than the next, this is where you go when you're in the mood for adventure! A road trip in the Balkans can be done in several different ways. We decided to start our trip in Greece. We felt that visa formalities were best handled by Greece, considering that we were travelling from India. Athens is a great place to start your trip and enter the Baltics. Alive, with its own brand of music, culture, history and delectable food Athens is a travellers paradise. Athens retains landmarks including the 5th-century B.C. Acropolis citadel with the Parthenon temple, the old Olymic stadium, Parliment Square and more which will transport you back many hundreds of years. From Athens you can visit Delphi, Kalambaka and the port city of Thessaloniki. While Delphi houses the ancient Temple of Apollo and the shrine of his oracle, which is world famous, Kalambaka is known for the Metéora monasteries. Thessaloniki is an especially lovely destination. It has boasts of sweeping sea views, delicious cuisine and its streets are colourful and vibrant with a touch of chaos. Bulgaria is a beautiful country with diverse terrain encompassing the Black Sea coastline, a mountainous interior and rivers, including the Danube. A cultural melting pot with Greek, Slavic, Ottoman, and Persian influences, it has a rich heritage of traditional dance, music, costumes, and crafts. The town we chose for the border crossing is Sandanski - which is a gorgeous little town famous for its spas resorts. This is a lovely place to indulge yourself in a variety of spa treatments, thermal baths and to relax with a walk in the park, which just happens to run along the banks of Sandanska Bistritsa River. And with a mountain range in the background. The heart of Bulgaria is it's capital city Sofia. Immensely popular with tourists, it dates back to the 5th century B.C. Awe inspiring monuments in Sofia include the Alexander Nevski Cathedral which was built in the neo-Byzantine style and the equally historic the National theatre - a stunning building created using the neoclassical style. And of course the Rila Monastery - the largest and most famous Eastern Orthodox monastery in Bulgaria. And also a UNESCO World Heritage Site. And when you're in the mood to relax and unwind, visit Vitosha boulevard for some shopping, local food and to grab a drink or two. Feeling the itch to travel? In parts Balkan and in parts Mediterranean, Macedonia is a fascinating country. With Roman, Greek and Ottoman history - it has a very interesting past. While it is known to tourists because of Lake Ohrid, its best to scratch beyond the surface and discover all that it has to offer. You can drive from Sofia to Skopje, the capital city, in about 3.5 hours. Don't miss the Macedonia square where you can view the statue of Mother Teresa - who was incidently born here; then make your way to the Old Varosha quarter where you come up, close with life in the Balkans. 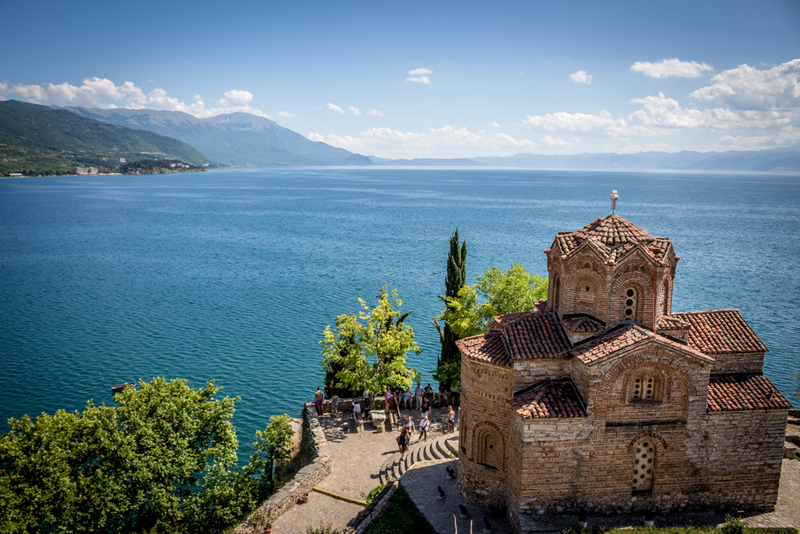 Ohrid is one of Macedonia's most attractive destinations. It has an aura that few places can beat. It has a beautiful old-town where monasteries and open-air ruins stand alongside traditional houses with red-tiled roofs. The massive walls of the centuries-old Samoil’s Fortress, at the top of the hill, dominate the city skyline. And of course, there is the sublime Lake Ohrid itself. One minute you're wandering through century old city walls and the next you can dipping your toes in Lake Ohrid. If you have time on your hands, then neighbouring Serbia and farther afield Albania are both excellent bets.